Several weeks ago I was doing my morning reading at Starbucks when I noticed through the window that people were waiting in line at the drive up. From my chair I could see car after car as they stopped in front of the window. Suddenly, I thought to start praying for each as they appeared in my field of view. Silently I asked God to meet their needs and to reveal Himself to them. 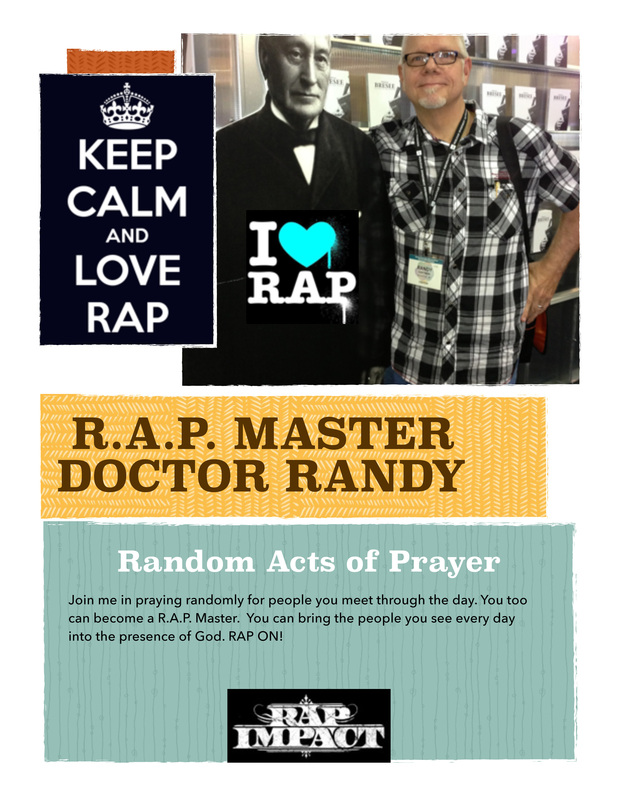 It crossed my mind that I was committing a “random act of prayer.” At that point I noted the first letters spelled out the word “RAP.” Huh. I was R.A.P.ping. This is now becoming a habit. It is energizing to be a secret R.A.P.per on the behalf of people I do not know. What a trip to bring people before the throne and they don’t even know it! It’s like I am some sort of secret agent for God. Many years ago I was asked to go and see a man who was dying in the hospital. I was informed he might not be very receptive to my presence. As I walked in the room my eyes were greeted by the sight of a shriveled up old man who indeed appeared to be on his death bed. I went over and introduced myself as a pastor who was there to pray with him. Somehow that weak, dying man lifted his head off the pillow about an inch. His eyes started to bulge. He struggled to speak. I learned forward. And in a quiet but shrill voice he demanded, “Get out! Get…out…of…here!” Exhausted from his efforts his head collapsed back onto the pillow. I told him I would leave but he could not stop me from praying for him as I walked down the hall. And so, as I walked out, I was R.A.P.ping, not knowing that years later I would have a name for what I was doing. Sadly, the man died the next day. Let me invite you to seek the status of Master R.A.P.per. Come and RAP with me. Your R.A.P.ping can help change the world of people you do not even know! Let’s start a movement. When you R.A.P. why not just enter a note about it into the R.A.P. Report to help encourage others?